You are given 5 circles, A, B, C, D, and E, whose radii are, respectively, 5", 4", 2", 2", and 1". Can you find a way to overlap circle A with portions of some or all of the other four circles so that the un-overlapped portion of A has the same area as the sum of the unoverlapped portions of the other four circles? That is, the red area is equal to the sum of the green areas. Circles B, C, D and E may overlap portions of each other as well as a portion of A. The overall principle is: A’s area is equal to the sum of the areas of B,C,D,E. So if you put some circle(s) of area X inside A and the rest outside, the red area is 25-X and the green area is also 25-X. The only constraint is that the circles inside must not overlap each other. Ditto for those outside. We can go further, I guess. Arrange some circles inside and the others outside. Let’s call the inside area Z, hence red area is (25-Z), and the outside areas are (25-Z). Now push one of the outside circles partway into A. If a circle of area Y straddles the edge of A, leaving area X inside and (Y-X) outside, then the red area is now (25-Z-X), and the green area is (25-Z-X) as well. put C, D, and E completely inside A without overlapping each other, put B completely outside A. 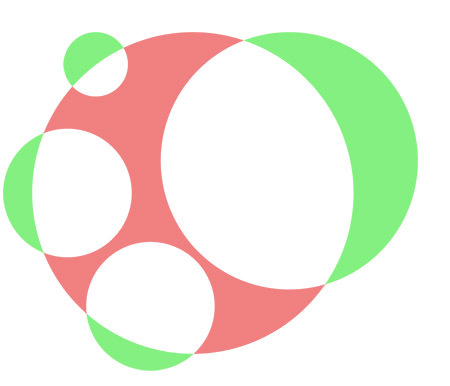 This leaves 16 pi inside (red), and 16 pi outside (green).